Here’s a fun fact: about 2 billion people in the world drink beer. Imagine what an Oktoberfest you could have if every beer enthusiast in the world attended – Ironically, an unforgettable one. What is also ironic is that in the month of October this year the largest merger in the brewer business took place. 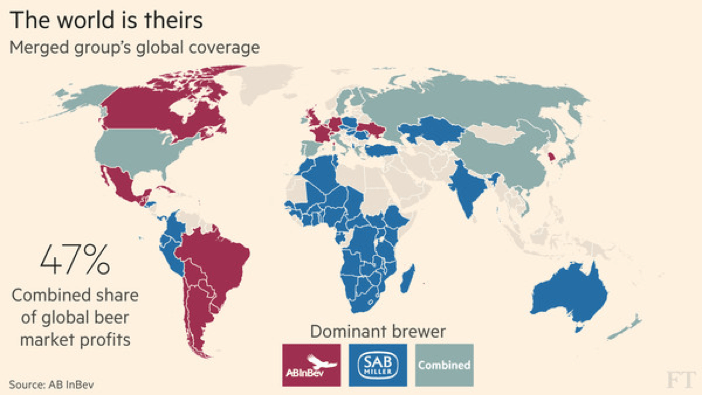 The plans of AB InBev to acquire SABMiller quickly caused a surge of global media coverage. Following the announcement by the world’s second-largest brewer, SABMiller, on the 16th of September of this year, articles were releasing updates so frequently it resembled the live commentary of your typical Saturday night football derby. The final proposal for the deal values SAB’s equity at £68 billion and amounts to £75 billion including net debt, as well as a partial share offer for 41% of SAB’s stock, worth £39.03 per share. How is this affecting the structure and composition of the beer market, from the producer perspective? What does this mean for us, the consumer? has come to face “its greatest challenge in 50 years”. As a socially enthusiastic university student for example, this ‘challenge’ may come to a surprise as beer consumption in the more established markets, Europe and the US, has been slowing. This can mainly be attributed to a recently trending shift in consumer preference, where many have switched to craft brews, wines and spirits. 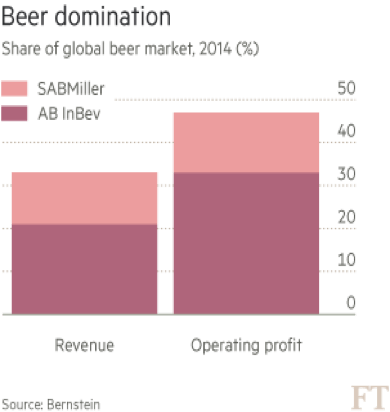 The craft brew ‘buzz’, particularly in the US, has seen volumes boosting by 18% in 2014, despite total beer sales remaining level. Due to the nature of the brewers’ environment a natural response to compensate for reducing consumption has been consolidation. AB InBev, headed by CEO Carlos Brito, is exemplary of this behavioral development in having successfully increased their revenues fivefold over the past 10 years through close to $100 billion in acquisitions. What a sobering result for Brito and his company. However, it is being predicted that AB InBev’s growth will slow over the following 5 years. Therefore, SAB’s presence in the faster-growing emerging markets quickly caught the attention of AB InBev. But what does this merger mean for other brewers in a numerical context? SABMiller, enjoying the largest market share in Latin America with its popular brands Cristal and Aguila, would facilitate a larger presence for AB InBev in countries such as Colombia, Ecuador and Peru. Although the prospects sound attractive and the future for AB InBev’s continued growth with a further acquisition appears secure, the world is not all rosy. With a merger of this magnitude, follow dozens of juridical complications due to the regulatory risks involved. While some analysts have argued that both brewers have a “distinct geographical split in their businesses”, the deal is likely to take 1 year to completion. The Bank of America Merrill Lynch and Banco Santander are leading the deal, which is expected to have 7 to 11 investment banks working on it in total, along with a number of advisors consulting both companies. Finally, how is this merger affecting our perceptions as consumers? While the article focuses on the US market and many American beer brands, the European market, viewed as equally established, possesses similar environmental characteristics and the hypothetical effects of the merger are universal. The result of such a brand positioning analysis from consumer perception offers valuable insights about the implications of the merger. 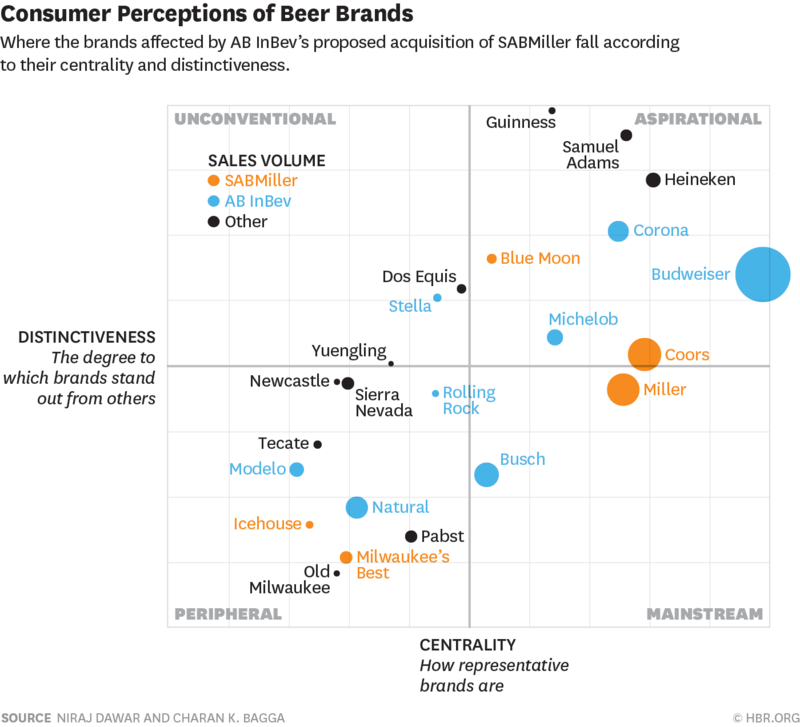 AB InBev would be the only player in the mainstream beer quadrant. Consequently, the new megabrewer would own the majority of all high volume brands in the mainstream and aspirational quadrants. Due to the comparatively higher distinctiveness of Ab InBev’s brands, this facilitates a stronger pricing power. 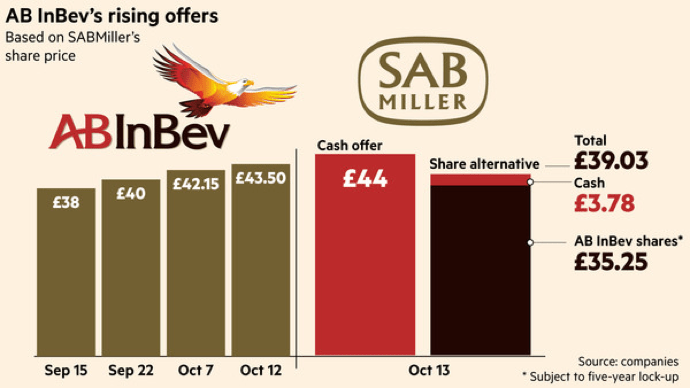 The synergies that could arise from the deal would allow for AB InBev to increase the distinctiveness of SAB’s brand portfolio, expanding their “pricing latitude, and the contribution margin from SABMiller’s portfolio” (Bagga, C. K. & Dawar, N., 2015). 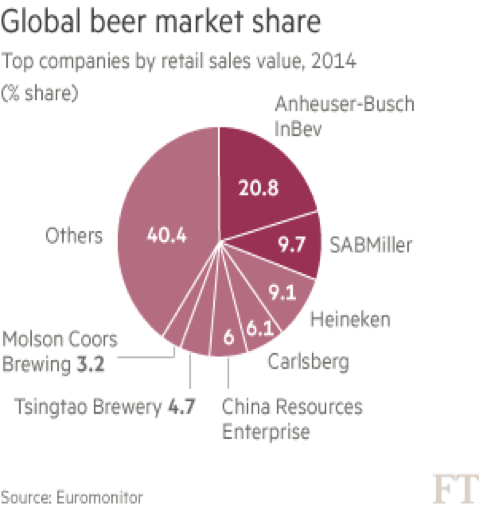 There are a number of further interesting implications explored in the article, which can clearly outline the tremendous control AB InBev can amount over the beer markets on global and regional levels. Ultimately, reporting from the CEO of AB InBev himself, Brito commented the takeover would essentially give consumers more choice because the new group would start selling the brands of both companies across the world. On behalf of all beer enthusiasts around the world, cheers!